Tracing seasonal trends in the level of tropospheric ozone is essential for predicting high-level periods, observing long-term trends, and discovering potential changes in pollution. Traditional methods for modeling seasonal effects are based on the conditional mean of ozone concentration. However, the upper conditional quantiles are more critical from a public-health perspective. In this example, the QUANTREG procedure fits conditional quantile curves for seasonal effects by using nonparametric quantile regression with cubic B-splines. The data used here are from Chock, Winkler, and Chen (2000), who studied the association between daily mortality and ambient air pollutant concentrations in Pittsburgh, Pennsylvania. 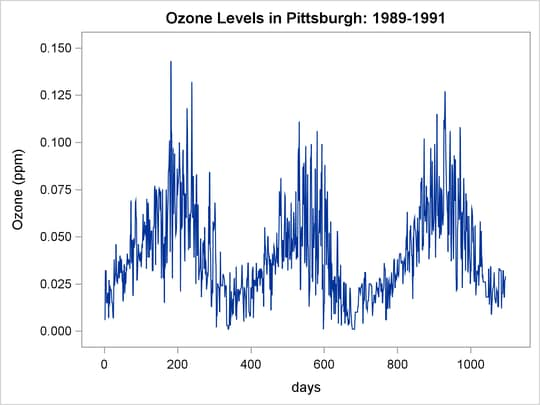 The data set ozone contains the following two variables: Ozone, which represents the daily maximum one-hour ozone concentration (ppm) and Days, which is an index of 1,095 days (3 years). 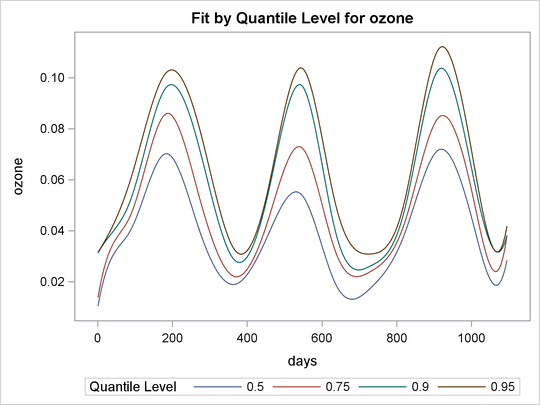 Output 95.4.1, which displays the time series plot of ozone concentration for the three years, shows a clear seasonal pattern. The EFFECT statement creates spline bases for the variable Days. The KNOTMETHOD=LIST option provides all internal knots for these bases. Cubic spline bases are generated by default. These bases are treated as components of the spline effect sp, which is specified in the MODEL statement. Spline fits for four quantiles are requested in the QUANTILE= option. When ODS Graphics is enabled, the QUANTREG procedure automatically generates a fit plot, which includes all fitted curves. Output 95.4.2 displays these curves. The curves show that peak ozone levels occur in the summer. For the three years 1989–1991, the median curve (labeled 50%) does not cross the 0.08 ppm line, which is the 1997 EPA eight-hour standard. The median curve and the 75% curve show a drop for the ozone concentration levels in 1990. However, for the 90% and 95% curves, peak ozone levels tend to increase. This indicates that there might have been more days with low ozone concentration in 1990, but the top 10% and 5% tend to have higher ozone concentration levels. The quantile curves also show that high ozone concentration in 1989 had a longer duration than in 1990 and 1991. This is indicated by the wider spread of the quantile curves in 1989.